Jen Daniels-Lake grows Certified Naturally Grown vegetables and herbs at her Wild Beet Farm in Indian Creek, Illinois, located 35 miles from downtown Chicago in the northwest suburbs. 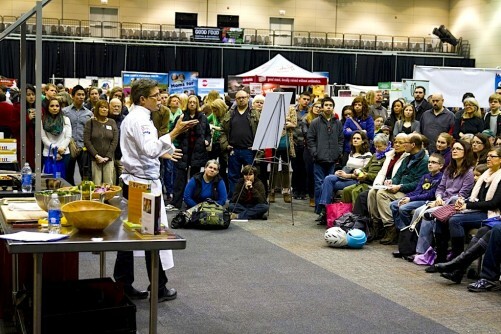 A member of the Chillinois (Chicago-Illinois) Young Farmers Coalition, Jen has provided permission for Good Food on Every Table to republish the following article about early spring on the half-acre farm, and the passion for growing that prompted her and her wife to start their small produce farm. Wild Beet Farm sells its produce through its Community Supported Agriculture (CSA) program, and is a member of Band of Farmers: The Chicagoland CSA Coalition. It also will sell in season at Chicago’s Glenwood and Andersonville farmers markets. 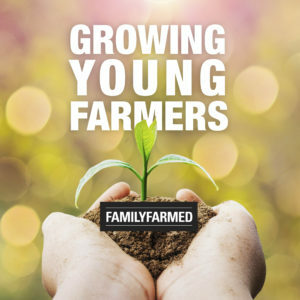 FamilyFarmed recently launched a training program centered on its new Direct Market Success manual that is heavily focused on the needs of young and beginning farmers. To learn more about the program, and to see how you can set up a training workshop in your area, please click here. The air outside has the first taste of heat. Dry pine scent fills my nostrils as I make my way out the back door of our home well past noon on the first sunny Saturday we’ve had in months. There are sticks, literally, everywhere, even though I played 52-pickup with the trees just a couple of weeks ago. Each step crunches under my yellow welly-clad feet as I make my way back to the makeshift greenhouse my wife built last season out of plastic tubing and two-by-fours. She texted me from her health-insurance-providing, coffee-slinging retail gig to remind me to open the doors to her greenhouse before it gets too hot inside for the plants. I’m an hour behind on checking my messages, lost in thought inside my head and oblivious to the beautiful day outside. I reach the greenhouse and with a bit of trepidation, I open the door to the structure and I’m greeted with the sharp smell of plant life and intense heat for an April day in Chicago. The onions, growing peacefully in their little trays stacked next to each other row by row, don’t seem to mind the delay. They stand straight up, doing the only thing they know how to do, materializing themselves into existence. It’s my first time this season stepping into the hot plant-filled greenhouse, and I’m instantly reminded of why we moved to this property just over a year ago. The magical room is full of life; full of the essence of earth, sweat and meaning. I spent all morning roaming around in my head, trying to put words to paper, and all those words evaporated upon stepping into this little sanctuary. My mood becomes joyful at the thought of the coming months of exhausting work ahead, surprising myself after feeling nothing but the burden of home ownership over the winter months. 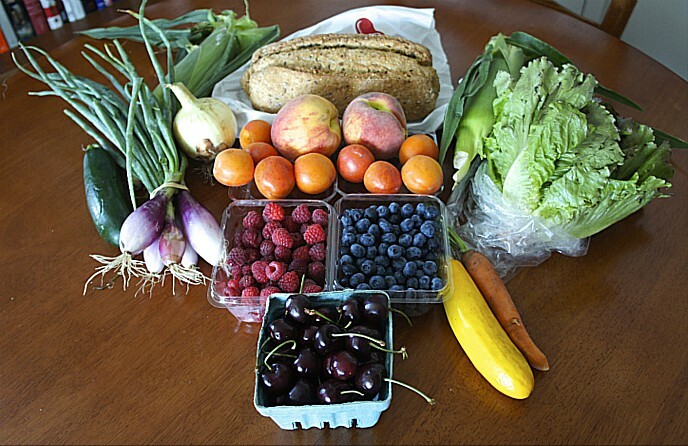 In winter, without the income from the farmers market, my wife and I have struggled to balance our finances and maintain our middle-class lifestyle. 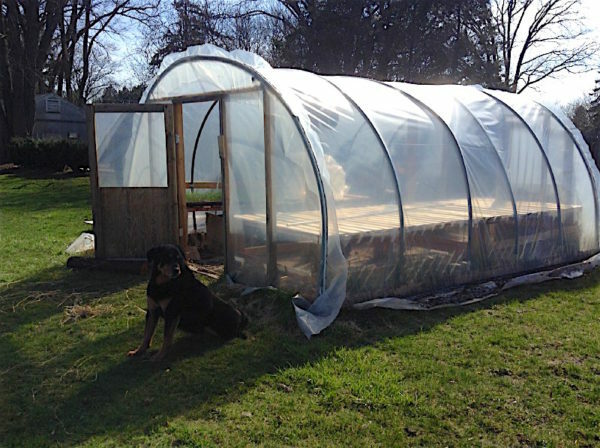 Although we did get a chance to rest due to the lack of farm work, the winter gave us barely enough time to recover from the previously grueling summer, when we both worked full-time jobs and ran our market farm stand on the weekends. We hoped the winter would give us time to settle in to our new home and make new friends, but now that we’ve reached the end of it, it feels like we accomplished little other than watch television and put a fresh coat of paint on the basement walls. The past five months seem to have evaporated, and now we are about to start the growing season all over again. But at least now that it’s spring, I can be jolted back to my senses by stepping foot in our little greenhouse. In here, we start to create the nourishment for our bodies that will take us through another summer, and eventually another winter. My short walk to the greenhouse reminds me that our presence on this land and our responsibility for it is a blessing to us, not a burden. We get to see the meaning of our hours of labor in the dirt stuck under our fingernails and in the smell of the warm aroma that comes up from the earth and finds its permanent home in our cotton hoodies. We taste the sweetness of life on our tongue in the fruit that bursts forth from the earth. The chives have already returned in our perennial garden and I bite down on a fresh sweet shoot, overwhelming my taste buds with its bright flavor. Although it’s still a few months away, I can taste tomato juices running down my chin in anticipation for the bounty that will surround us soon. Plants take their time coming out of their winter slumber. 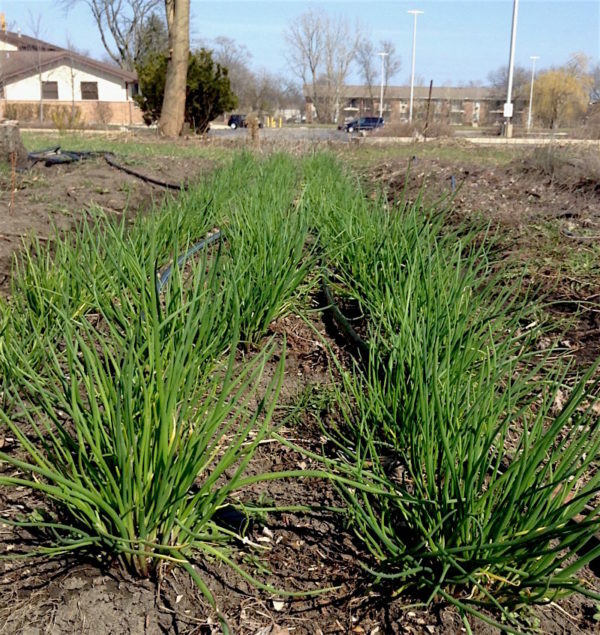 The appearance of the chives, like clockwork, on the first spring day, gives me faith that not all movements are always visible. Our roots on this property are slowly deepening, at their own speed, invisibly. Without resentment, the trees are calling for me to gather their fallen twigs once more. My heart is magically opening, finding space and desire for fires and lovers and friends and community, when yesterday I had said no more. As I start to make my way back to the house, John — the landscaper for the church next door — pulls up in his tractor. I wave to him, thinking he’ll keep on going, but he stops and chats with me for a moment. He says his guy is really excited to break out their chainsaws and cut down a couple of a trees on our property in exchange for the wood. My wife said it would be okay. I nod, “Thanks, John. That sounds great.” “Well, have a nice day, I’ve gotta get back to work,” he says. I smile. This entry was posted in Community Supported Agriculture, CSAs, Direct Farm Marketing, Direct Market Success, Family Farms, Farm businesses, Farmers markets, Good Food business development, Growing Young Farmers, Local Food, Small Farmers, Young farmers and tagged Band of Farmers: The Chicagoland CSA Coalition, Certified Naturally Grown, Chicago farmers markets, Chillinois Young Farmers Coalition, Community Supported Agriculture, CSAs, Direct Market Success, FamilyFarmed, Growing Young Farmers, Small farms, Wild Beet Farm, Young farmers. Bookmark the permalink.